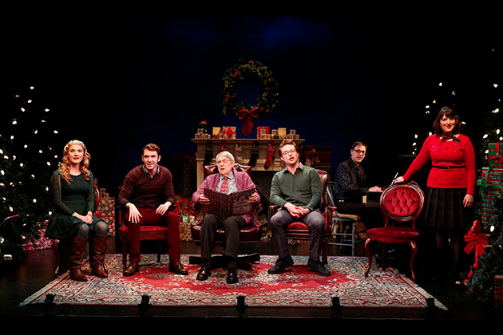 Katie Fabel, Kenneth Quinney Francoeur, John Cullum, Ashley Robinson, Mark Hartman, and Jacque Carnahan in A Child's Christmas in Wales. Photo by Carol Rosegg. BOTTOM LINE: A nostalgic—if wholly idealized—look back at Dylan Thomas’ childhood celebration of Christmas. A Child's Christmas in Wales comes to the stage in a new adaptation by Charlotte Moore, based on Dylan Thomas' 1952 radio play by the same name. As the play opens, two women and three men, including a now-adult Dylan Thomas (Ashley Robinson), sit on a stage furnished to look like the living room of an affluent early-20th century home. Three well-decorated Christmas trees twinkle. Indeed, it looks like a Norman Rockwell painting come to life, with piles of gift-wrapped packages, a blazing fire, and a piano waiting to be played. As the assembled kin—none save for Dylan are ever named—wax nostalgic about holidays past, the audience learns that each year brought “songs of merry gentlemen” and useful presents—wool vests, scarves, and picture-less books—as well as bags of jelly babies, whistles, and games. There was snow, too: in this rendition the heavens never failed to send beautiful white flakes to welcome Santa and envelop the new-born Christ child. As memories unfold, the ensemble periodically breaks out in holiday song, with familiar tunes like "Deck the Halls" and "Silent Night" to traditional Welsh melodies performed in their original language. There’s beauty here, and humor, as an afternoon visit to Mrs. Fogarty’s nearby home is recalled and family foibles and the personal quirks of individual family members are shared. What’s more, we’re told that the always-delectable dinner was followed by the telling of tall tales and ghost stories, a ritual that typically led to more singing. Contented children soon fell asleep, we’re told, secure in the knowledge that “next year, we’ll again be together.” All this occurred while smiling and tireless wives and mothers spent hours in the kitchen and then scurried to clean up the day’s mess without complaint while the men kicked back and enjoyed a smoke. On one level, the reverie seems lovely, however staid. Closer scrutiny, however, reveals something much more disturbing: in conjuring up a simpler, but more sexist and heteronormative world, today’s viewers will likely be unable to ignore the play’s reinforcement of rigid gender norms or its matter-of-fact assumption that all little boys grow from rough-and-tumble pranksters into cigar-smoking men and all little girls grow from mama’s little helpers into mothers and wives. It wasn’t true when it was written and it is certainly not true now. This makes A Child’s Christmas in Wales nostalgic, sweet, and highly unrealistic. In fact, despite pleasurable moments of music and jest, the play is essentially an artifact of a time best forgotten or left to historians to analyze, critique, or parse for meaning. A Child's Christmas in Wales is adapted and directed by Charlotte Moore. Mark Hartman provides musical direction. Costumes are by David Toser. Lighting design is by Michael Gottlieb. Production Stage Manager is Pamela Brusoski. Assistant Stage Manager is April Ann Kline. Producing director Ciaran O’Reilly. The cast includes Jacque Carnahan, John Cullum, Katie Fabel, Kenneth Quinney Francoeur, and Ashley Robinson.